Since March 2016, this website is no longer maintained. Click here for my current website at the University of the West of Scotland. Best Student Paper Award, 13th IEEE International Conference on BioInformatics and BioEngineering (BIBE), Paper: "Enhancing the Performance of a Microarray Gridding Algorithm via GPU Computing Techniques". 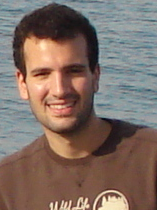 Best Student Paper Award, SPIE Photonics Europe 2012, Real-Time Image and Video Processing Conference, Paper: "A contourlet transform based algorithm for real-time video encoding", 2012. Graduate Thesis included in the 2009 annual selection of B.Sc. and M.Sc. theses of the Department of Informatics & Telecommunications, National and Kapodistrian University of Athens, 2009.